If you are thinking about attending one of our Horse First Aid Courses, but you can’t make up your mind I understand. It’s perfectly natural to worry about whether you are making the right decision to join a course or a workshop for the day. It’s not just the price, you might need someone else to care for your horse and other pets/ family. So you need to be sure that you will get your moneys worth from joining the course. With that in mind here are some of the common concerns about joining a Horse First Aid Course - and my suggestions. 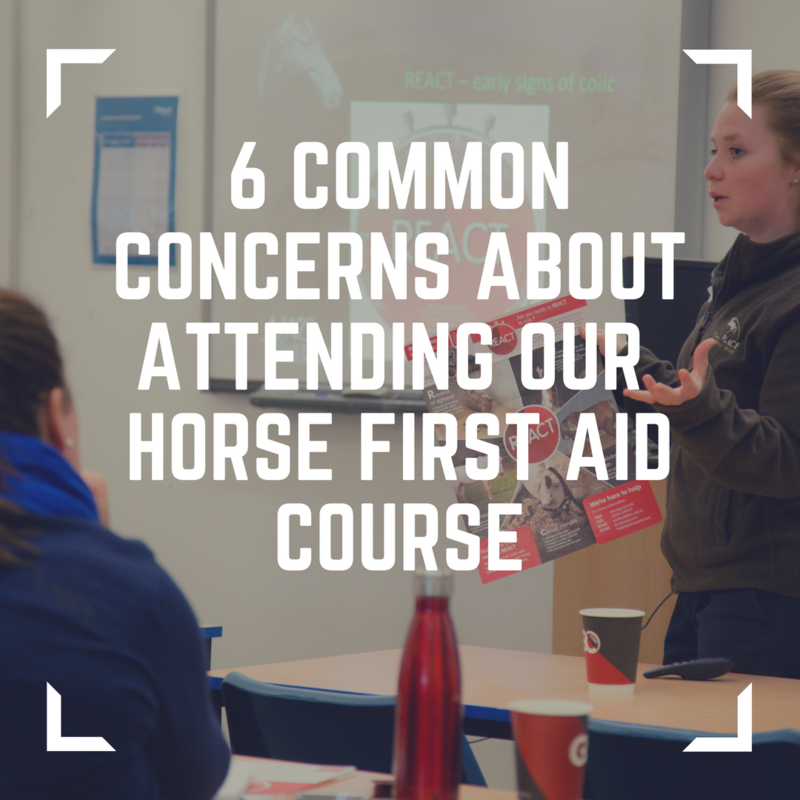 If you aren’t familiar with our Horse First Aid course this is a one day workshop with other horse owners and riders, where you will get a whole days training with a vet. You will learn about keeping your horse healthy, which vital signs to record and what to have in your equine first aid kit. One of our vets will teach you about wounds, how they heal and which ones require a vet, and how to dress a wound. You will discover the early signs of colic which most horse owners can’t recognise and learn how to cope with equine emergencies such as choke, nosebleeds and cast. You will be taught the key times to call the vet, and how to reduce the risk of infectious diseases such as strangles. Sometimes owners tell me that they would love to come but they can’t afford it. There are lots of expenses with horses, but many owners report that they have saved money on vets bills by coming on our courses, because they really understand when to call the vet. Try them out and let me know how you get on. Don’t forget that you could bring some of your yard friends along with you, we offer a group booking discount of 15% for groups of 10 or more, so it might be worth seeing if you could make a trip all together. Sometimes I am contacted by potential delegates for the course who like the look of the course program, but are worried that they might be out of their depth on the day. Don’t panic, you do not need a science degree to attend our Horse First Aid Course. We cater for several levels of knowledge in the course, and our vets do a fantastic job of building this detail. If you are new to horses don’t worry you will take away the key points that you need to make better decisions for your horse, and to know when to call the vet, saving you time and money in the future. If you are more experienced you will retain more of the detail, and you can ask questions on each topic. Our vets are so knowledgeable that you will certainly leave the day with the information you need. If you haven’t attended one of our courses before you might feel worried about not knowing anyone. Attending a workshop or a training day can be a bit intimidating, particularly if you are going on your own. Firstly I do everything possible to make the courses very friendly and welcoming, and our groups are around 20 people so you aren’t walking into a room of 100 strangers. We are all their primarily because of our love of horses, it's not hard to strike up a conversation with a fellow horsey person. I also send out a really detailed email before the course, so that you know exactly where you are going on the day. Finding the venue, the parking and the correct room certainly makes the day less stressful. Finally whilst you might not have met me yet you probably have seen me from the videos on my Facebook page and website. Have a look at this video about me, my company and why I run these courses. Sometimes we are contacted by people saying I’d love to come on the course, but I don’t have my own horse. You certainly don’t need to be a horse owner to attend our Horse First Aid Course. We have plenty of people attend our courses who ride other people’s horses, share a horse or are thinking about getting their own. It really doesn’t matter either way. You will get all the same benefits of updating your knowledge, getting the correct information from our vet, being confident and prepared for any horsey emergencies, and knowing exactly when to call the vet out. As a horse owner there is a lot of juggling involved, horses take a lot of time to care for never mind fitting it in around work, family, pets and everything else. Our course is a one day workshop, and yes if you need to look after horses and family before and after it might be a busy day it is only one day. Perhaps you could muck out for a few friends and they might be able to return the favour on the day of the course to save you some time on the day. After attending our Horse First Aid Course many owners tell me that they are actually saving time, because if their horse has a cut/ rash/ if off colour they now know exactly what to do, and aren’t having to ask numerous people on the yard, then spend hours googling. We often have yard owners and yard managers contact us saying that they are interested in our course, but they feel that they probably have sufficient knowledge or experience on these topics. In the same way that human first aid requires a refresher every two years, equine first aid and how to cope with horse emergencies changes. Is your knowledge really up to date, have you really got the latest recommendations on all the conditions and scenarios that we cover? When horses are your income it is vital that you keep your clients, how nice for your clients to see that as well as continuingly riding, competing and training you are updating your horse care knowledge as well, which will only help you care for their horses better. I have run two large equestrian centres, and in over 15 years in the equine industry I don’t think I could ever have enough knowledge. With more yards improving their bio-security isn’t it sensible to find out what you could do to decrease the risk of infectious disease in your establishment? A strangles outbreak is very costly for a yard, isolation can be difficult to implement and the loss of revenue and future earnings can be huge.